The Bombay Paperie will teach you how to reuse, reinvent, recycle and turn paper scraps into your own handmade paper ensuring optimum usage of our limited environmental resources. 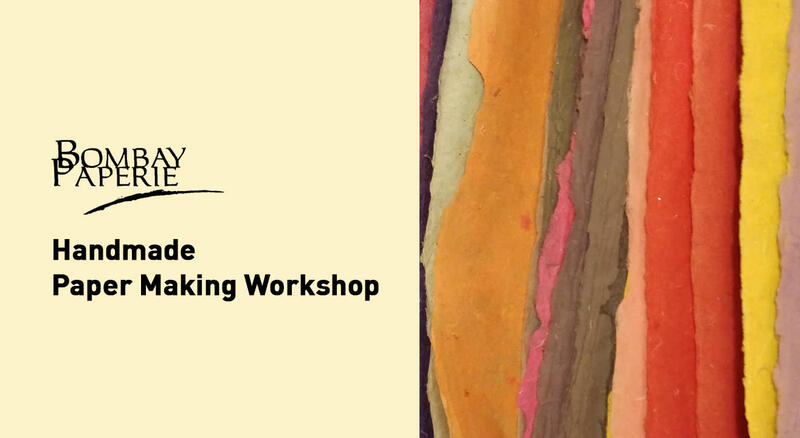 This workshop provides an excellent opportunity to learn how to recycle bills, newspapers, old books, prints and scrap paper into sheets of handmade paper. You can use these papers draw, write , sketch or anything you like to do with paper. This is an organic and environmental friendly way to make your own paper and learn a new skill. You can use these papers to draw, write , sketch or anything you like to do with paper. Workshop will include how to make pulp from old papers. Brief description on how to use molds and deckle paper making tools. Brief description on paper Gsm & Quality. What will you take home ? Five beautiful sheets of handmade paper. We offer an inclusive workshop on this ancient art of paper-making with waste paper which will be 2 hours of hands-on, creative fun. All age groups are welcome , no prior experience is needed and all you have to bring is your creative bent of mind and a willingness to learn something new. Seats are limited so buy your tickets here to avoid disappointment.